Loyal and friendly, the Clumber originates from Nottinghamshire. Bred for hunting, these gentle, loveable and hardy chaps are just as happy in wild moorlands, fetching the unfortunate bounty of country sportsmen, as snuggled up on a sofa with the whole family. Clumbers have a long history of royal approval and were a particular favourite of King George V (perhaps the good King was a fan of fur-balls and spittle, because these spaniels are renowned for their constant coat-shedding and over active drool glands). They also have a great nose, and will happily help you sniff out those lost car keys or TV remote. The Clumber wants to be carrying something in its mouth almost constantly, so make sure your slippers are somewhere safe. Unfortunately this habit can potentially lead to health issues, as they occasionally swallow inappropriate objects by mistake. They are also very large-boned and may suffer from temporary lameness in their first year, as well as hip dysplasia and spinal-disc herniation. Clumbers can be aloof with strangers – so if one is nice to you, you know they really mean it. Just like all the best people, really. 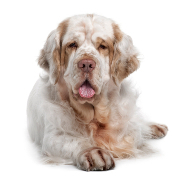 By joining this group you use the buying power you share with other Clumber Spaniel owners to get a better deal on insurance. Currently, there is an offer available with VetsMediCover, so please join the group to find out more.